Langrisser Mobile global English version is now officially out after the beta test conducted in last year. In the game, the player deploys a certain number of heroes on the battlefield, strategically move & attack, get the most out of the terrains, and combat against evils, other players in PvE and PvP game modes. You progress through the chapter route, unlock new features, heroes, soldiers, class, and explore a vast Langrisser world. If you have just started playing it or looking for a rookie guide, some tips, then today’s Langrisser Mobile guide and Langrisser Mobile tips, cheats & strategies will help you. ⇒Langrisser Mobile game features turn-based battle mechanics. Before you dive into the battle or start the battle, you can set up the team(heroes, their positions on the battlefield) at preparation screen. At the bottom-left corner of the preparation screen, drag the character and replace it with one of the characters on the battlefield. However, In some of the battles, heroes are locked by default and you can not replace them. At the top-right corner of the screen, you can check the number of heroes you can deploy on the battlefield. Additionally, on the preparation screen, you can get the details of the enemy by tapping a specific enemy unit. It’s a good idea to check the enemy details and select the strong hero/soldier units. ⇒Each hero carries a group of soldiers in the battle. Upon enemy attack, these soldiers receive the damage first. However, the enemy can use the skills to attack the hero directly. You can change the soldier class in hero profile menu. ⇒You can not attack an enemy from anywhere on the battlefield. The target should be in the range. Tap on the hero and you will see blue and red tiles. The blue tiles show the range where you can move a hero. While the red tiles indicate the danger zone, out-of-movable range, and attackable zone. In short, you can attack an enemy if he/she is on the red tile. Similarly, you can check the enemy’s movable and attack range; tap the enemy to discover. In Langrisser Mobile, if you move the hero to favorable terrain, a special defense boost will get activated. You can get it over woods, cargo, mountain, ramparts, and tomb terrain. Additionally, the main terrain of the combat field impacts the movement speed. You should take it into consideration when picking the heroes. When setting up the team, make sure to check the enemy’s class type and pick the right heroes. In Langrisser Mobile game, heroes come in rarities; SSR, SR, and R. You can get some heroes through chapter quests. The game will gift you a set amount of hero shards upon completion reward and you will be able to summon that hero for free. But you can not get all the heroes through the story mode. The ideal way to get heroes in Langrisser Mobile is through summoning. Go to the summon menu and there you will see different banners; event, normal hero summon, equipment summon, and friendship summon. There are only 2% chances of getting an SSR unit. You can try your luck in the event banners if you are looking for a specific hero. To summon heroes, you need trinity vouchers. You can get these vouchers from story mode, events, mission reward, and as a progress reward(path of light). Additionally, you can exchange trinity crystals for these trinity vouchers in the store. To check the complete list of heroes in Langrisser Mobile, go to the summon menu -> at the bottom-left, tap the gallery option -> heroes -> here you can check the complete list of heroes featured in Langrisser Mobile. Some of these heroes can also be summoned using friendship vouchers. You can use EXP potions to level up heroes. These EXP potions grant Experience points to the player. A hero can also obtain these points if you add him/her in the team. Go to the hero menu -> tap a hero -> tap the details button(arrow on the right side) -> tap the + icon and select an EXP potion. You can unlock new skills for the hero and unlock new soldiers by advancing classes. To advance the hero class, you need advancing material; battle practice scrolls. You can obtain these scrolls form Time Rift game mode. Go to the hero overview menu -> tap a hero -> details -> class -> advance. Advance the class multiple times to master it. After it, you will be able to upgrade the class. Tap the upgrade class button at the top-left -> here you will see the class tree. Each class offers unique class skills and key stats. You can switch between the unlocked classes any time. As we mentioned above, each hero in the battle carries a group of the soldier. You can change it in the hero profile menu. To unlock new soldiers, upgrade to a specific class. Also, keep in mind that some soldiers can be unlocked via training. You can upgrade the star level of a hero if you have enough shards available. Tap the upgrade stars button to star-up that character. For example; 1* to 2*. It will also increase the stats/talent. Additionally, when you upgrade the star level of these heroes; Grenier, Matthew, and Almeda, their rarity will also increase; N to R. You can obtain the shards through summoning. You can increase the hero stats by equipping the gears; weapon, armor, helmet, and the accessory. There are a number of ways to get equipment; chapters, Time Rift mode, and summoning. We would not recommend you to spend trinity vouchers in equipment summon as you can easily obtain high-quality gears for free from chapter & time rift, achievement, gifts, and chests. Strengthen -> You can increase the level of equipment by using strengthening material. You can obtain this material through time rift game mode or from chapters. Upgrade Stars -> To increase the level cap of equipment in Langrisser Mobile, you need rune and the same name equipment. You can get runes from time rift mode. Enchant -> Using the enchant scrolls, the player can improve the equipment stats; enchanting grants random stats to that gear. Training field feature gets unlocked after chapter 7. This feature lets you train the soldiers; Infantry, Lancer, Cavalry, Flier, Aquatic, Archer, Bandit, Holy, Demon, and more. To train the soldiers, you need training material; drinks, specific class type material. You can obtain these material items from the expedition or by playing the secret realm mode. Bond System – Gift heroes to get returns; bonus effect, rewards. Arena – Fight against other players(A.I.) for honor points and ranking reward(trinity crystals). You can exchange these honor points in the store for rune stones, trinity vouchers, chests. Note – This is not the official Langrisser Mobile tier list. We will update this Langrisser Mobile tier list with more details soon. So that’s all for now as Langrisser Mobile guide. Let’s check out some quick TL;DR Langrisser Mobile tips, cheats & strategies! Make sure to check the whole battlefield. If there is a chest, move your character there and stand on that tile to grab that chest. You can obtain some great rewards from these random chests. The game allows you to look into the enemy stats before starting the battle. Make sure to check their stats; class type, soldiers, skill and deploy the strong class heroes on the battlefield. And, within the battle, pay attention to the danger zone, healing, terrain buffs, enemy moves. In the time rift mode, you can get the instant rewards from the stages that you complete with 3-stars. You can improve the infantry, lancer, cavalry, and all types of units’ stats through training. And you should do it asap if you are stuck on a boss stage or chapter. Participate in the Aniki’s GYM daily challenge, send the heroes on the expedition to get training material items. 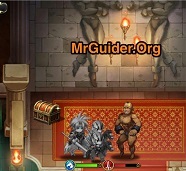 You should join a guild asap and participate in the guild dungeons to earn guild medals that can be exchanged for precious items such as rune stone, equipment, and more. In addition to it, you can earn gold, red nuts, and more. So these are the basic Langrisser Mobile tips and a basic Langrisser Mobile guide for the beginners. Previous Post:Utopia: Origin – How To Tame Blue Horse?